Entries with tag training . Starting in the Customer Success Center (CSC) at Railinc gives employees a solid foundation to build on as they work to reach their career goals. In this guest post, Railinc Customer Success Specialist Karin Bennett talks about the phone calls, the schedule, and the opportunities to learn, grow and make an impact across the company. Click here to find out more about our Railinc Customer Success team. Before I started working in CSC at Railinc, I saw customer support like most people probably do: a large group of employees in a room answering phone call after phone call — all day, every day. I do answer a lot of calls—as many as 30 a day—but there’s more to it than just answering the phone. We're the first point of contact most of our customers have with Railinc. When I'm not answering calls or responding to emails, I work with colleagues across the company to ensure I know our products and services inside and out so I can help make the customer’s experience better. I don't have a typical day. If I'm not on-call, I get in at 8 a.m. and begin responding to customer emails from the night before. New cases start coming in soon after and include everything from permission requests to unlocking online accounts to questions about error messages a customer might receive when working in our applications. Beyond responding to phone calls and emails, CSC oversees reviewing permissions requests from customers who want to access our applications. We put each request through a verification process to make sure that customers get the right permissions and that our data are secure. We test applications, keep important industry databases up to date, and play important roles in company-wide disaster recovery exercises. But we aren't expected to be subject matter experts from the start. Every Railinc customer success specialist goes through a 90-day training period to learn the basics of all our products and get comfortable interacting with customers. We do things like unlock online accounts, respond to email requests, and send a "morning report" to the entire company that recaps any issues from the last 24 hours, as well as any completed or scheduled product releases. After our first 90 days, we keep learning through product training sessions and shadowing groups throughout the company. We also work closely with Railinc's product support teams, which provide second-level support, and attend meetings and training for individual product groups. I like shadowing product support because I end up having a greater understanding, not only of the products they support, but of processes that I can repeat with customers to provide quicker support. This training helps us understand Railinc products, keeps us up to date with product releases and lets product groups know about any persistent issues customers have had. It feels good to know that the customer feedback we collect and share is used to improve our products. Because we provide 24/7 customer support, there is an on-call rotation. For one week every two months, I'm responsible for responding to emergency requests that come in after business hours. While I haven’t experienced an emergency call during my rotation yet, one team member had to facilitate a conference call at 3 a.m. when one of our applications went down. It can be challenging, but it's a reflection of how important a responsive CSC team is to Railinc's work. It's tough learning the freight rail industry and all our products and services as an entry-level employee, but it positions us well to advance in the company quickly. A lot of our product support employees, managers, business analysts and others started on Railinc's CSC team. The opportunity to grow and advance is just one of many things I like about working in CSC. It might seem like I’m tethered to my phone and computer during work hours, but I can take advantage of Railinc's flexible work environment, too. I have been able to participate in company events and work from home when there is inclement weather or some other reason I can’t come into the office. A CSC role isn't for everyone. You need to multi-task. You need to be patient as you figure out what you can to do to help a customer with their challenge. And you need to make sure the customer gets what they need. At Railinc, our job in CSC is about more than just answering phones. We’re helping build a strong foundation with our customers and supporting the work everyone throughout the company does. A graduate of North Carolina State University, Karin Bennett joined the Railinc Customer Success team in 2017. Interested in becoming a Customer Success Specialist at Railinc? Apply today. Employee training is an important part of Railinc’s culture. From certifications to regular lunch and learns to on-site training in a working rail yard, employees have a variety of opportunities to grow their knowledge of Railinc technologies and the freight rail industry. Remaking the way business analysts, developers and others approach their work, like the Railinc Rules and Process Modernization (RPM) program is doing, requires a significant training effort that helps educate employees on new technologies and concepts. "We're digging into our applications and rewriting rules,” said Jeanine Bradley, senior manager of rules and process management at Railinc. “We're developing standards we can apply company-wide and ways to assess work outcomes. And we're training a lot of our people, teaching them new technologies and new ways to approach their work." This is the second in a two-part series on Railinc’s Rules and Process Modernization (RPM) program, its impact and the training the company is providing. Click here to learn about the program and how it is changing our employees’ approach to their work. Nearly all Railinc business analysts have completed training that focuses on capture, analysis and specification of business rules. Many have attended business process model notation and rules authoring training as well as sessions on technologies such as RuleXpress. 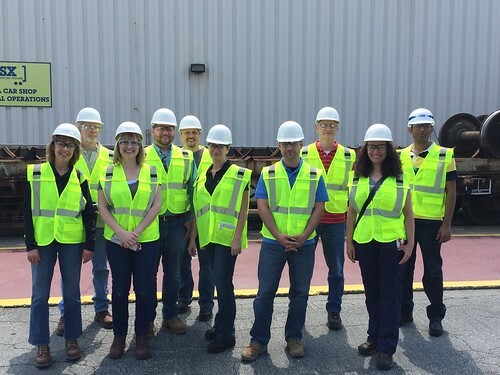 This year, 15 business analysts are participating in an intensive, hands-on "learn-by-doing" training program that pairs Railinc employees with outside business rules experts. Railinc employees participate in RPM training. Railinc is also conducting training sessions for technical staff, including developers, quality assurance engineers and architects. As part of the RPM program, Railinc is implementing technologies that will support these modernization efforts, including the Red Hat JBoss BPM Suite. Red Hat is one of Railinc's longtime technology partners and the Red Hat JBoss BPM Suite had the flexibility and cost-effectiveness required for the RPM program. Red Hat JBoss BPM Suite provides key capabilities, including the flexibility of open source, which prevents vendor lock-in and promotes innovation for both technical and business teams. Red Hat recently featured Railinc's RPM program in a case study that highlighted the increased agility, improved productivity and enhanced industry knowledge that the RPM program and the Red Hat solution are enabling. "Red Hat strives to help our customers meet their business needs in a flexible and open manner, and we're pleased that Railinc chose JBoss BPM Suite as part of its modernization initiative,” said Phil Simpson, Red Hat’s JBoss BPM product marketing manager. “With Red Hat BPM Suite, Railinc is providing essential business rule management facilities for its customers in the freight rail industry." Nearly half of Railinc’s project development activities involve the implementation of rules and processes. So when Doni Reece saw the connections among Railinc systems, industry terms and equipment components mapped, she recognized the potential a networked view had to help employees understand the myriad rules and processes that underlie the company’s applications. As a business analyst, Reece works on Railinc’s Umler® system, a cornerstone rail industry application that supports numerous other products, from Early Warning to Component Tracking. Being able to see the relationships mapped into “neighborhoods” gave her new insights into these connections, eliminated assumptions around equipment and component classifications, and was a first step in standardizing language and terminology around rules and processes. This is the first in a two-part series on Railinc’s Rules and Process Modernization (RPM) program, its impact and the training the company is providing. Click here to read about the training that is part of RPM implementation. The work, done in partnership with outside consultants, is part of Railinc’s Rules and Process Modernization (RPM) program, an ongoing five-year initiative to develop operational processes, enhance employee skill sets and leverage technology to modernize Railinc’s rules and process management. Launched in late 2014, the program will enable Railinc to take a more consultative approach with customers and will help to improve the efficiency, consistency and reliability of the rules and processes and optimize the work around them. The North American freight rail industry depends on specific business logic to ensure the proper movement, interchange, monitoring, and repair of more than 1.5 million railcars across a 140,000-mile rail network. This business logic—often expressed as rules and processes—has traditionally been buried in code in Railinc’s applications, making it difficult to respond quickly to customer questions or requests, update applications, or share knowledge across the company. For example, recently a customer wanted to know if individual railcars were qualified to carry a specific commodity and provided the commodity specifications. Railinc documented these specifications in the business rules engine, then ran the rules against the Umler system to instantly generate a list of which railcars could or could not transport the commodity. As a result, the customer could take action based on the inquiry in record time, keeping their freight cars—and their business—moving. The RPM program is shifting the responsibility for rules authoring and management from IT to the business side of the company, increasing agility by enabling seamless knowledge transfer among developers, business analysts and customers. Business analysts, product support specialists and others will be able to research and update rules within an application without help from developers, which will free up time for IT to focus on development tasks. Railinc is in the process of completing nearly a dozen technical assessments of applications to understand whether they are compatible with a rules engine, as well as business assessments of three product groups. The company is modernizing business rules and process management for five applications in 2016. Railinc teams will also apply what they’ve learned to a new application that is expected to launch this year that will analyze and report on equipment failure data. This work is in addition to developing standards for internal authority over business rules and terminology, conducting multiple proof-of-concept projects and defining metrics that will help measure the productivity of development teams. As a release administrator on Railinc's Infrastructure Services and Support Team, Robert Redd works to make sure the company's applications are working for customers and that developers have the infrastructure they need to do their jobs. He tweaks automated builds to account for changes developers make to code. He makes sure the automated build system is functioning properly. He creates dashboards for performance and uptime analysis for Railinc systems. And he keeps up with new technologies that can improve the way the company's developers work. "I'm always learning new things at Railinc," Robert said. "We're always trying out new technologies to see if they fit our goals as a company." Recently, Robert participated in a beta Jenkins certification initiative and became one of the first Jenkins-certified engineers in the world, earning the CloudBees Jenkins Platform Engineer Certification with the support of Railinc. Jenkins is an open-source continuous integration tool that powers Railinc's automated testing and build systems. Railinc has used the tool since its release in 2011 and used its predecessor, Hudson. Jenkins is critical to the development process at Railinc. Anytime a developer submits a code change, Jenkins reads the code and immediately begins compiling and testing it. Robert also uses Jenkins to help make developers' jobs easier, automating tasks such as the deployment of applications to development and pre-product environments, the building of queues and the creation of listener ports. Before Jenkins, Railinc would do a build every three to six months. At the end of a development cycle, Robert said, there would be late nights spent compiling code and looking for errors. Now, we can do builds every two weeks and the tedious tasks that seemed to take forever are automated. "Jenkins supports the Agile methodology we use here, and it helps immensely with our code quality and speed to market," Robert said. A former tank commander in the U.S. Army, Robert came to Railinc in 2000 as a Java team lead and has also held business analyst and database administrator roles. As he has moved from role to role, he has taken advantage of Railinc training to keep up with technology changes and find new ways to work. You can learn more about Robert in his Careers profile. "The certification shows how Railinc supports efforts by employees to learn new technologies and even get recognition for their knowledge," Robert said. "We're encouraged to use and test and learn new technologies here, and I get to work with a lot of different tools, which is really fun." Certifications are just one way Railinc supports its employees' professional growth. It's not unusual to see dozens of employees packed in the company's training room for regular technology training sessions that cover everything from Java to security to data storage. Most new employees come to Railinc with little knowledge of the freight rail industry. To help give their careers in the industry a kick start, the company provides training that covers railroad industry fundamentals. Railinc even sends groups of employees to CSX's Railroad Education and Development Institute (REDI), where they get a firsthand look at a working rail yard and get to pilot a locomotive simulator, drive a railroad spike and learn about rail safety. Click the image below to view a slideshow highlighting a Railinc visit to CSX REDI. There are also more personalized resources that supports career development, from online training tools for business and technical skills to a Career Paths program, which helps employees design their own personal action plan for pursuing their career goals. Railinc also offers a generous tuition reimbursement program, which employees have used to pursue advanced degrees like MBAs and to take a one-off course to refresh skills or just learn something new. "The freight rail industry is constantly changing, as is the technology we use to support it," said Jerry Traynham, Railinc's chief information officer. "These kinds of initiatives and the training and education employees like Robert get help employees reach their career goals and help develop the innovative thinkers we need to serve our customers."